Imagine what you could create in a Kitchen of Your Dreams with delocon Kitchen and Bath Showroom, and StarMark Cabinetry! Showroom Hours: M-W-F 9am-5pm, Tues-Thurs 9am-8pm Sat 9am-3pm & other evenings by appointment. CALENDAR of Events May 16–26 — The Music Man At Springville Center for the Arts. Tickets are $15 general, $12 for students and seniors and $10 for groups of 15-plus. April 6 — 2019 Chamber Awards Gala At St. Al’s Parish Hall. The event gives local business owners, their employees, members of community and civic organizations and others who have a positive impact in Springville the opportunity to relax with a night of food, refreshments, entertainment and a special awards ceremony. April 6 — UNOVA Coworking Open House One of Springville’s newest businesses, UNOVA Coworking, will host a grand opening event on Saturday, April 6 from 10 a.m. to 6 p.m. at its location at 29 Mechanic St. in Springville. The event will include a ribbon cutting at 4 p.m.
April 13 — Songwriter Showcase At Springville Center for the Arts. Nick Kody hosts SCA’s annual Songwriter Showcase highlighting original music from the Western New York area. Tickets are $12 presale, $15 at the door. Doors open at 7 p.m., showtime at 7:30 p.m.
April 18 — The Wiyos Concert At Springville Center for the Arts. The Wiyos packed the house when they last visited in 2013. This time they’ll take up residency in the Parsonage and bring workshop programs and other fun. Tickets are $12 presale, $15 at the door. 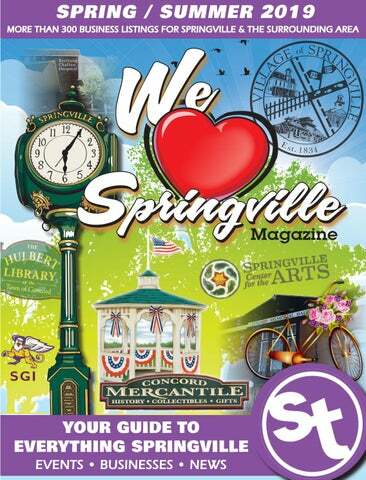 May 4 — Art Crawl 2019 The annual Downtown Springville Art Crawl from 5:30 to 8:30 p.m. with free activities for all ages throughout the National Register Historic District. May 11 — Springville Craft Beer & Wine Festival At the Springville Volunteer Fire Company Hall from 4 to 7 p.m. May 11 & 18 — Printmaking Workshop At Springville Center for the Arts. Class will be limited to 8 persons, 16 and older. 8 a.m. to 5 p.m. All materials will be provided at the cost of $60/52 member. Call 592-9038 to register. May 18 — Springville Pageant of Bands Downtown Springville. June 7–9 — WNY Dairy/ Agricultural Festival At Springville-Griffith Institute High School, 290 North Buffalo St. Celebrate the 30th anniversary of the festival in Springville. June 15 — Springville Center for the Arts Gala At Springville Center for the Arts. The party to not miss this summer. Come for the food, entertainment, drinks, silent auction, basket raffle, and nine-hole putt-putt golf course. July 13 — Springville Area Garden Walk The Springville Concord Garden Club will host its annual walk 10 a.m. to 4 p.m. throughout downtown Springville and the surrounding area. The event is free and open to the public. July 19 — SGI All Class Reunion At Fireman’s Park, 71 Nason Blvd. July 27 — My Generation Music Festival At Former Earl’s Restaurant, 12139 Route 16 in Chaffee. Hosted by the Tri-County Kiwanis Club. There will be four bands, including Terry Buchwald as Elvis, a Beatles and Rolling Stones tribute band and local Return Trip Band, playing the oldies everyone loves. A classic car and cycle show, craft vendors and food trucks add to the festivities. ERIE COUNTY FORESTRY Hiking opportunities await at the Erie County Forestry on Genesee Road in East Concord. A network of several miles of marked and unmarked trails traverse the property ideal for a hike in the woods for beginners and experts of all levels and ages. Terrain varies from gentle to steep. A series of trails are also specially designed for equestrian use. SPRAGUE BROOK PARK If it’s a spring a summertime adventure you’re after, look no further than practically in your own backyard. Sprague Brook Park, located at 9674 Foote Road in Glenwood, is an outdoor enthusiast’s paradise, with more than 2,220 acres of parkland. Miles of trails await for everything from hiking to take in the emerging leaves. Park-goers can also camp at one of the park’s many sites. SCOBY DAM PARK Scoby Dam Park is located on the banks of the Cattaraugus Creek just off Route 219. The Erie County Department of Parks, Recreation and Forestry acquired the dam and surrounding property shortly after the village of Springville ceased using the dam for power generation in 1998. The park is managed as a “conservation park” with minimal improvements and facilities. This area offers great opportunities for water sports, fishing, picnics and a view that is enjoyable for all. GRIFFIS SCULPTURE PARK The 450-acre Ashford Hollow park, located 10 miles south of Springville off Route 219, is one of America’s largest and oldest sculpture parks, featuring over 250 large scale sculptures dispersed through miles of hiking trails. Each sculpture was placed with the natural setting in mind, creating a truly unique experience between art and nature. Whether you have five minutes or five hours, visitors can always get a flavor of the park. Hot Sauces, Cuba Cheese Curds, Condiments, BBQ Rubs, Sauces, Marinades and Much More! across Western New York, will be juried into the show. Some of the work on display is even for sale. “Every year we add more businesses, and my dream is to have light-to-light every business participate,” Wochensky said. Wochensky said the plan to continue having outdoor musicians, the arts underground and the kids’ space. “One thing we’re exploring adding this year is the addition of arts demonstrations and miniworkshops in the afternoon leading up to the crawl,” he said. Wochensky said in recent years, people have started showing up to the crawl earlier and earlier and there has been an increase of people coming from out of town, so having demonstrations in the afternoon before the crawl begins would give them all more to see. “We are encouraging community organizations and causes to set up,” he added. “We started that last year and it was very successful.” Wochensky said any local organization that is interested in having a space to set up and engage the public can contact the Center for the Arts. Once 8:30 p.m. hits, businesses close and the afterparty begins at Springville Center for the Arts, located at 37 North Buffalo St. VOLUNTEERS NEEDED Rural Transit Service provides safe and reliable transportation to eligible residents of rural Erie County through the help of our dedicated Volunteer Drivers, Dispatchers and Drivers Aides. You can help in your own community! • Help riders on/off vans • Carry groceries, etc. something for the whole family, regardless of age. “Creating a space on Main Street where people can interact is so important, and I wish we could do it more often and in more ways,” he added. Even if you aren’t an artist, musician or business owner, Wochensky said any can still get involved and volunteer during the event. Just call the arts center at 592-9038 or email scaseth@gmail.com. Parking is available in the large municipal parking lot south of Main Street or off Franklin Street. This pedestrian-friendly, free, walking event is held rain or shine. The crawl is sponsored by Springville Center for the Arts, a charitable nonprofit organization. ALL OF YOUR GARDENING QUESTIONS! CHECK US OUT EVERY WEEK! of Commerce, will be and given to Jeanne Ellis years Dawn Wible for their the of volunteer work in annual Oktoberfest event and their other community involvement. Specialty Classes for all ages, 2-18 Quality Dance Instructions in a Safe, Friendly & Rewarding Environment. The Springville Center for the Arts always has programs going on, and from April to June, programs will begin to pile up in preparation for summer! The art gallery is always open for visitors. This spring, the arts center is including “The Collection of Bruce Blair.” Exhibit dates are from April 17 through June 1. Whether you have little artistic skill or have no artistic skill at all, printmaking could be a fun class for you! Printmaking uses linoleum block printing techniques. You can work at your own pace to create one to two color prints. If you already have experience, you can use other techniques such as reduction printing or pattern printing. The class is with Mary Anderson and limited to eight people, 16 and older. All materials provided at the cost of $60/$52 member. The center always has things going on for the young ones. springvillearts.org/sca/ On June 15 from 6:30 p.m. to 9 p.m., the Springville Center for the Arts will be hosting their annual Gala. The Gala consists of music, mini golf, basket raffle and, of course, food! It is a nice evening under the stars to listen to music and enjoy the company of friends. “Gala tickets are on sale now,” Wochensky said. A $30 ticket includes minigolf, food and drink. Kids under 21 are free. Call 5929038 for tickets. 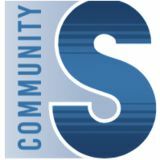 The center is “now partnering with the Village of Springville and the Town of Concord” to provide the free Summer Concert series. There will be different styles of music and possibly some of our local food trucks, Wochensky said. They are looking to “expand their audience” and are considering moving the concerts to Heritage Park. There is so much happening at the Springville Center for the Arts in the next couple months, so make sure to get those tickets and enjoy the upcoming performances! businesses in Springville’s historic downtown. The artwork, submitted from across Western New York, will be juried into the show. Most of the work on display is for sale. Once 8:30 p.m. hits, businesses close and the after-party begins at Springville Center for the Arts, located at 37 North Buffalo St. Refreshments will be provided in the Olmsted Gallery, which features the Spring Community Exhibit. “Crawlers” vote on their favorite artist by ballot and the award is presented. Parking is available in the large municipal parking lot south of Main Street or off Franklin Street. The event is held rain or shine. A pedestrian-friendly, free, walking event. The Crawl is sponsored by Springville Center for the Arts, a charitable nonprofit organization. 7 p.m. at the Springville Volunteer Fire Hall on West Main Street in Springville. Serving Western New York for over 30 years! like to participate, also let the chamber know via email and they’ll add you to their mailing list. Tickets for this year’s event will be $25 pre-sale through May 8 and will be available online, at the chamber office inside the Lucy Bensley Center and at select Springville businesses. Tickets will be $30 at the door. Harold Hill as he cons the people of River City, Iowa, into buying instruments and uniforms for a boys’ band that he vows to organize, despite the fact that he doesn’t know a trombone from a treble clef. His plans to skip town with the cash are foiled when he falls for Marian, the librarian, who transforms him into a respectable citizen by curtain’s fall. Under the direction of Don Wesley with musical direction by Doris Jones, performances begin Thursday, May 16 and run through Sunday, May 26 in the Mongerson Theater at the Springville Center for the Arts. (716) 592-2923 Bill Gugino Builders, Inc. can do it all from General Contracting, Custom Homes and Commercial and Construction Management! area for two days of performances and competition. The event is highlighted by the annual parade down Main Street on Saturday, May 18th at 1:30 p.m.
July 13 — Springville Concord Garden Walk downtown Springville and the surrounding area. The event is free and open to the public. even overflowing. It is really great to see the excitement growing. The Craft Show will be returning again to include Friday evening, along with both Saturday and Sunday. The committee is still working on “something for everyone.” This year’s theme is “Celebrating WNY Dairy/Ag Festival’s 30th Anniversary.” The festival takes place at SGI High School, at 290 North Buffalo Street, with the parade route and other activities happening all over town. Fiddlers Green lives on and so does the music and entertainment. Continuous music will be happening all day beginning at 11 a.m. at three venues: Fiddler’s Green Park, Heritage Park and the Concord Mercantile General Store. Stop by the Jam Tent and The Trading Post for more musical entertainment, and be sure to check out the cloggers in action at historic Goddard Hall. Good health begins with a healthy mouth and teeth. Go with the original refinishers locally owned and operated! International Warranty Service Division of siding manufacturers. St. Matthew’s Tree Services, LLC. Bring us your Prescription Lowest Possible Prices! native brook trout” that spawn in some of the tributaries. The Upper Cattaraugus starts at Java Lake Outlet in Wyoming County. Major tributaries in Cattaraugus, Erie and Wyoming counties include: Spring Brook, Hosmer Creek, Clear Creek, Elton Creek, McKinstry Creek, Lime Lake Outlet. The only concern Tobia said he has heard was that some fishermen thought the steelhead might present too much competition for brown, brook and rainbow trout in the Upper Cattaraugus. Tobia believes there is enough of insects, baitfish and habitat in the Upper Cattaraugus and its tributaries to go around with the introduction of steelhead after the dam is lowered and the fish ladder installed. “I think it will be OK,” Tobia said. “The DEC has done the studies. I don’t think the effects will be that much in 10-15 years. There will be a lot more (fishing) access and opportunities” in the Upper Cattaraugus. The full draft study is available on the DEC’s website. We are a multiple listing real estate company selling homes, vacant land, commercial real estate and farms. Let our experience assist you in getting a mortage. As an Allstate Agency, we have the privilege of meeting with a lot of families. We enjoy being part of the community, and building relationships is one of the best parts of our jobs. As we choose cars, homes, boats and more to fit our lifestyle and budget, it is very important to do the same when it comes to protecting them. Please give our agency a call. We look forward to getting to know you and helping you find the insurance coverage that meet your needs. The Winkey- Krolikowski Agency is located at 14 North Buffalo Street in Springville, New York. Stop in to visit with us, or call 716-592-4047. Thank you! Building on tradition since 1988. Subject to terms conditions & availability. Allstate Fire & Casualty Ins. Co., Allstate Vehicle & Property Ins. Co., Allstate Property & Casualty Ins. Co. ©2018 Allstate Insurance Co.
Hand Painted Polish Pottery. A one of a kind gift for mom this Mother’s Day! Valid 3/29/19 - 5/31/19. Coupon must be present at time of purchase. Photos by Jaime Dickinson Springville senior Mason Goodridge directs his teammates on a play during a high school boys basketball game this season. Goodridge finished the season as Springville’s all-time leading scorer with more than 1,400 points. Our experienced team has the qualifications and state-of-the-art equipment necessary to get the job done right the first time, every time. Rely on us for projects small and large. Whether you are constructing a new building, need a septic system installed or a lot cleared, we are your top choice for fast, prompt, professional service. LOADED! 110,516 miles. Every maintenance receipt V6, heated leather, remote start. Only 61k miles catalogued. Financing Available: Stop in today, pick out your next vehicle, and we’ll work together to get you approved at a great interest rate.